No, not the Hearst Castle, the Hearst Museum at the UC Berkely campus. Named after Phoebie Hearst, philanthropist mother of William Randolph Hearst the newspaper man and creator of the Hearst castle and the inspiration for the Orson Wells movie, Citizen Kane. This place used to be called the Lowie museum, named after an anthropologist. Something must have happened to trigger the name change, probably a gift of money. That's usually what motivates change. So anyway, Mike Livingston was in town and he had never seen the baidarka frame at the museum before, so we went to visit it. Mike also arranged for us to see a bunch of baidarka models that were in the museum storage. I wasn't expecting to see much new stuff since I had been to the museum twice before. And models tend not to offer much insight either. So all in all, my expectations were low. But as it turned out, I did learn a bunch of new stuff and noticed things that I hadn't noticed before. So overall, this turned out to be quite an enlightening trip. A few photos and some brief comments follow. This is not a full analysis of the situation which I hope to work up and post somewhere but just a quick overview of what I noticed. Here is a picture of the bow of the Aleut kayak from Atka. 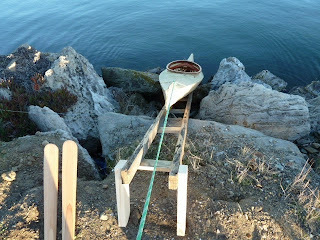 Of special note is the lashing at the top that ties the deck stringer to the bow plate. You might have to click on the photo for a larger view to see it clearly. 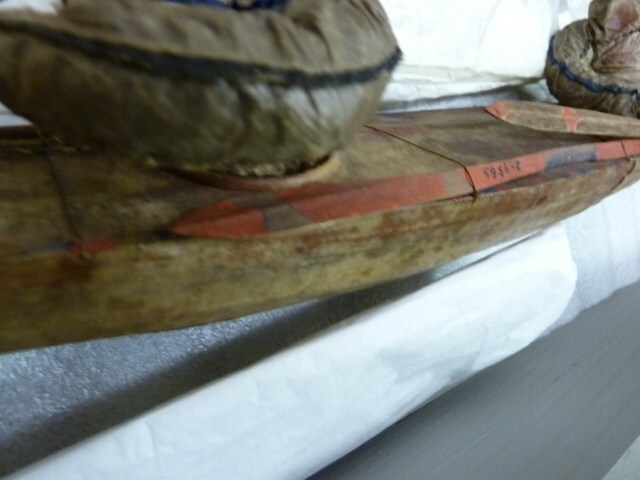 Anyway, the string goes through the deck and then through a hole in the vertical part of the bow assembly. What I noticed was that this was one of a number of modifications to the boat made by someone other than the original builder. My suspicion that it was other than the original builder who made the add-ons is based on two things. The original build was of very high quality and workmanship. And the builder didn't paint the frame red until all the building was done, including the boring of holes. 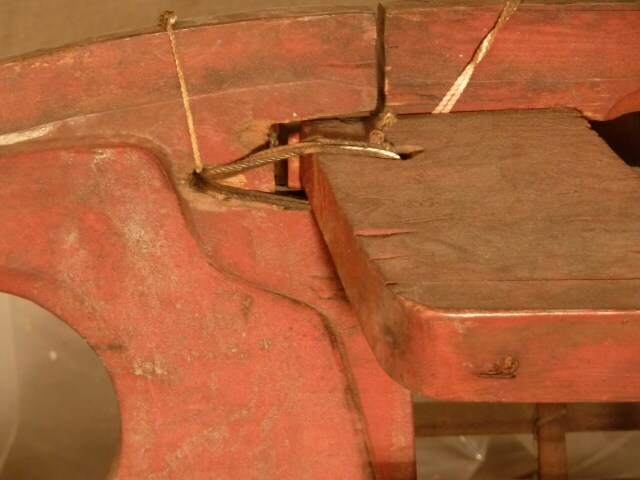 What makes me think that the bow lashing was an add on is that the holes are rougher than the original lashing holes and that they are not painted, that is the boring of the holes exposed fresh wood. The same goes for the stern. 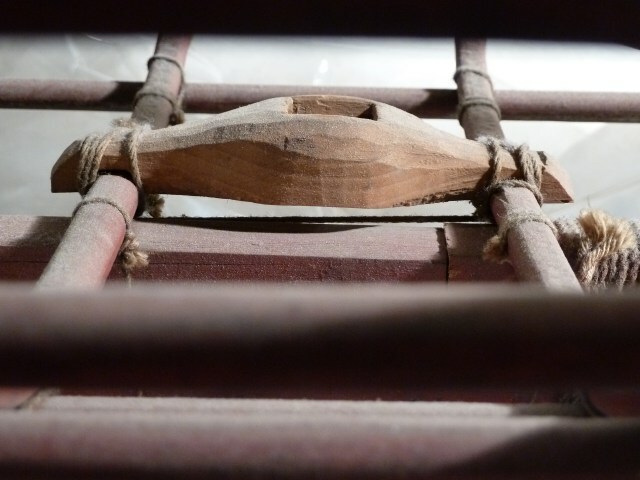 A new lashing was added to tie the tail fin into the stern cross block. Not shown here are three more additions that would reduce the flex of the frame. Apparently, the add ons were made to stiffen up the boat. Why would someone want to stiffen up the boat? Apparently to sail it. Here is the mast step add on lashed to the ribs. We saw the sail that was used with this boat, but didn't take it out of its plastic bag. We looked at a bunch of baidarka models as well. For some reason, all but one were two-holers. No singles. As I already mentioned, I wasn't expecting much since models are usually not to scale and distorted for ease of building, but these were quite accurate. The detail on the deck gear and paddles was especially revealing. What sets these models apart from some others I have seen is that they were apparently made by men who had also done the full size boats and gear, so the detail was quite authentic. I especially noticed the paddles. 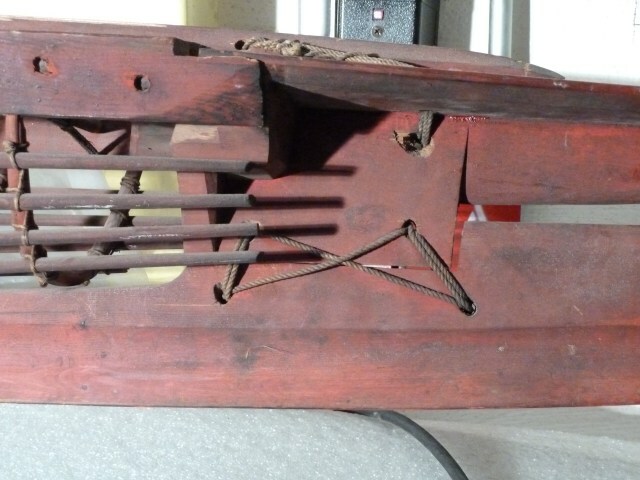 The one pictured above and below was of the short loom variety. I don't think that all paddles of that period had short looms, but some definitely did. Looms were on the order of 18 to 20 inches and blades were on the order of 40 inches. 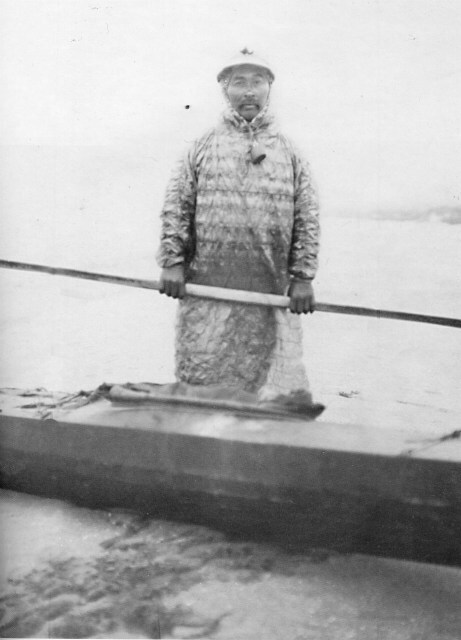 Here is a picture of a guy holding his short loom paddle. 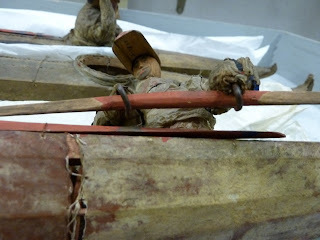 I think that paddlers held these paddles like Greenlanders held their short loom paddles, that is, thumb and forefinger curled around the loom at the root of the blade and the rest of the hand sitting on the root of the blade. What we built this year at the APIA culture camp was an open cockpit baidarka that would be easy for people to get into and paddle. On the last day of camp we took the boat out to the Alaska Native Heritage Center and launched it in the pond there. Everyone who wanted to got a chance at paddling it. The 2010 APIA culture camp had some Aleut visitors from Russia. 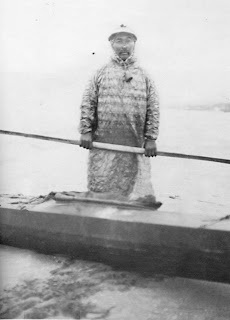 When Alaska was still a Russian colony, the Russian transported a number of Aleuts from Atka and Attu to the Commander Islands to do the fur hunting there. A few of the old people still speak the Attuan dialect of Aleut or Unangam Tunuu. 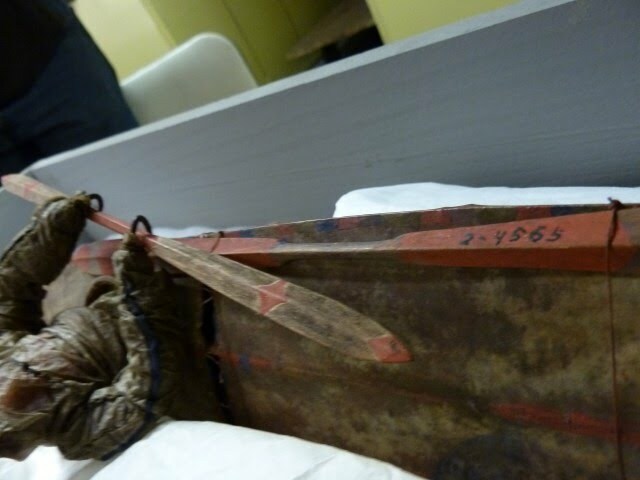 The Russian Aleuts like the American Aleuts are trying to conserve some of their traditional culture. Anyway, here is a little clip of the Russians performing a song. Sally Swetzoff of Unalaska on the left is helping them out. I am reading a pamphlet by Howard Chapelle on the Chesapeake bateaux, also knows as skipjacks. These had hard-chine hulls which are easier to build than hulls with round bilges. Chapelle claims that anyone with basic carpentry skills could work on constructing these which brings me back to requirements for the post apocalyptic boat, namely, that just about anyone in the population with some rudimentary skills should be able to put one together. 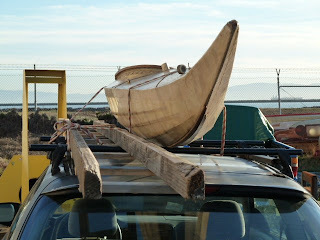 A lot of the boats in fishing cultures were built by fishermen and not necessarily boat building specialists. As a consequence designs had to be simple enough that pretty much anyone could learn how to build them. This was also true of kayaks. 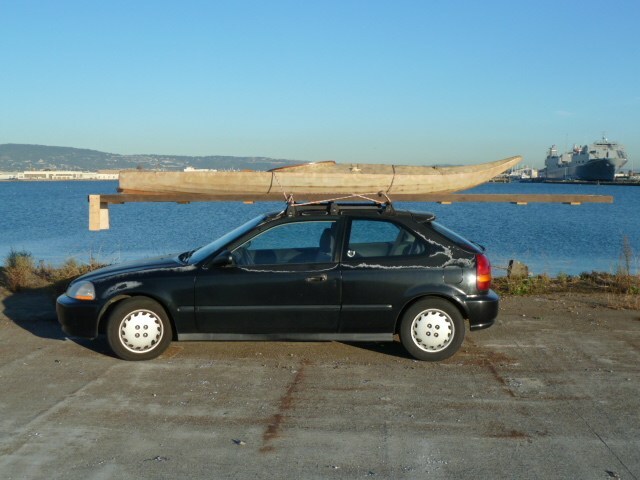 In a culture where you starved if you didn't hunt and hunting required a kayak, you better be able to build one. I just moved into my new shop location. The good news is that there is water a mere hundred yards from where I store my boats. The bad news is that it looks like the picture above. Big rocks to climb down with a boat. It's 16 feet from the top to the bottom. I thought of building something semi-permanent to make getting a boat in and out of the water easier but it's public property and therefore might have a limited lifetime. So I didn't want anything elaborate. What I came up with was a ladder-like contraption that I could slide the boat up and down on. A friend had given me some redwood deck lumber that was going to be tossed. Luckily it was 16 feet long, just the right length for my portable ramp. And it is easily hoisted on top of the car. 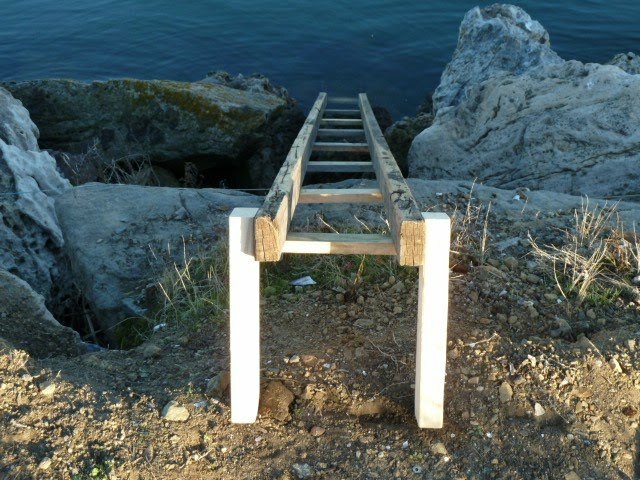 Yesterday I did a test run of the ramp. The water was close, but I hauled things by car just so I'd have someplace to lock up my camera and other stuff while paddling. Plus it gave me a chance to test long distance portability of the rig. Here's the ramp, deployed. The long pieces are spaced about 7 inches apart. 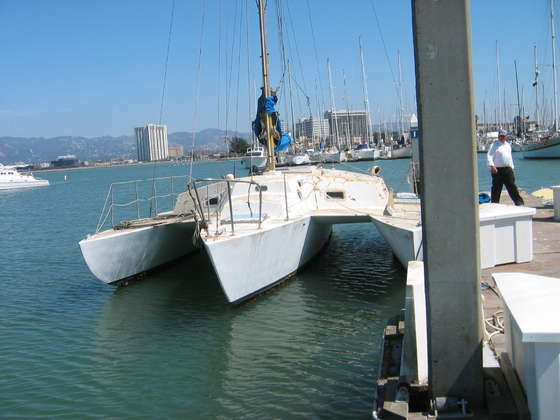 That separation allows the boat to slide down the longitudinals without the keel dragging on the cross braces of the ramp. 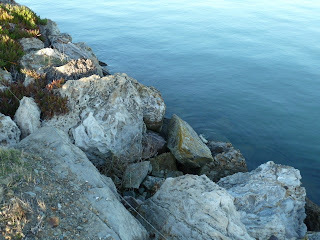 The two vertical pieces of two by four keep the ramp from sliding down into the water. Here's the ramp in action. The slope is steep enough for the boat to slide down without any assistance. You can't see it in the photo, but I planed down the inside edges of the runners to make contact surfaces less sharp and less likely to injure the boat. And there's the boat, successfully launched. I didn't have a photo assistant so I don't have any pictures of me climbing into the boat. That was actually the hardest part of the whole deal, climbing in and out of the boat while the boat is floating. It's much easier getting in and out of the boat on a beach. I was able to stabilize the boat with my paddle while climbing in and out of the boat but that's hard on the paddle with these sharp barnacle covered rocks. Should have brought my boat pole. Next time. In any case, I might need to add some sort of light weight, easily portable launching platform to the rig. Overall, I have to say the ramp was a success. This particular boat I launched doesn't weigh much but I have some that are fairly heavy and a real pain to carry down those rocks, so much of a pain in fact that I wouldn't want to do it without the ramp. And it's a local solution engineered specifically for this spot. But heck, what isn't engineered for a specific purpose. Universal technology costs a whole lot more and doesn't work nearly as well. Long as I'm on a post-apocalyptic streak here, let me post two more pictures. The first one, above shows one of those WWII era steel lifeboats used on Navy craft. 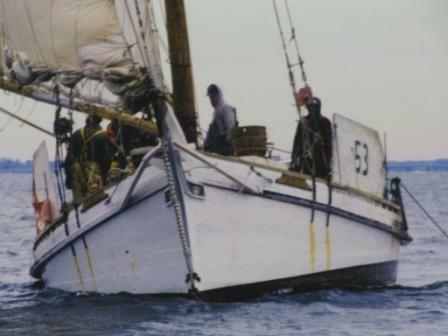 It appears to have been outfitted with a custom rudder, a mast and a new coat of paint. Haze gray is the original color for these things. I don't have a story for this boat except that there were a bunch of people with camera equipment and walkie talkies running around apparently doing some sort of cinematography. You could tell they were professionals because they took themselves very seriously. "Tim's philosophy involves building minimum-consumption personal infrastructure from recycled scavenged materials. Redirecting the waste stream. Doing much with little. A reverse peace-corps to learn from poor people all over the world." If that isn't post-apocalyptic, then I don't know what is. I couldn't find my waterproof camera for a while. But the other day I did. It was in a bag in the front hall closet where the kitty litter used to live. 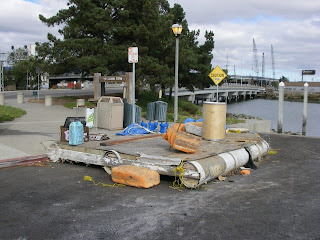 Anyway, the camera is back and on it, more examples of local post apocalyptic boat building. I don't know the story of this particular piece of post apocalyptic engineering other than that the Oakland police or some other organization with nautical jurisdiction dragged this item out of the water, up the ramp and into the parking lot at the Oakland aquatic center. I don't know the reason for their hostility to its presence in the harbor, but I assume it has something to do with potential hazard to navigation. Another thought just came to me. 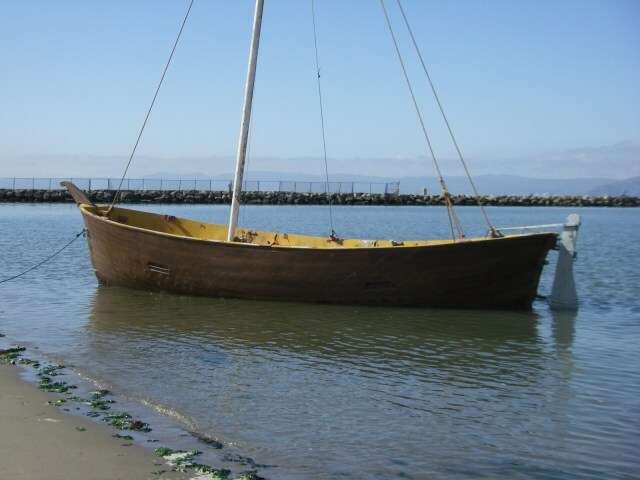 I think that one of the potential problems with this craft is that it may have been a live-aboard anchored out in the harbor, not paying any fees. The pictures could probably speak for themselves, though I couldn't resist adding some comments. Rear quarter view of the raft. I don't know if all the stuff on it and around it was part of the setup, but let us assume that it was. 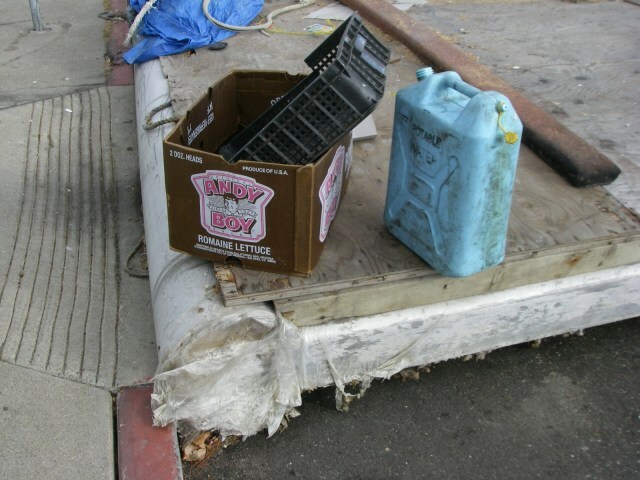 Here is a closeup of some of the cargo. Some storage units, plastic and cardboard. Andy Boy Romaine lettuce. They were eating healthy or maybe not. The blue thing, a water container? And now some closeups of structural details in case anyone wants to copy this design. 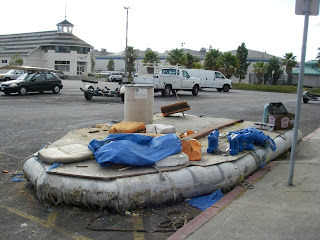 The basic design was stolen off one of those inflatable rafts or Zodiac thingies. Only instead of flexible air tubes, these guys used large pvc pipes and stuffed them with plastic foam. The pipes were cross linked with dimensional lumber. 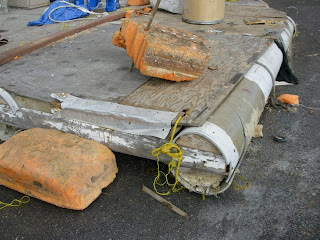 The orange lumps are pieces of dock foam, the stuff used to make floating docks float. It is hard to tell what those were for, perhaps auxilliary or outboard floatation, or could these have served as dinghies for ship to shore transport? Here's a rear view of the craft. Decking is plywood. The seam between sheets is bridged with a 2x6. There is also a center floatation tube, perhaps for hydrodynamic reasons. 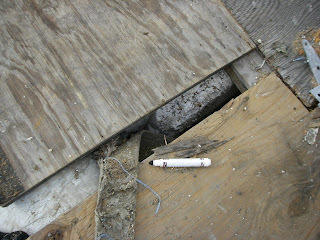 And a gap in the decking reveals interior floatation, white styrofoam. The marker was not part of the cargo. Every once in a while I feel the need to examine why I build skin on frame boats. As for any other thing that we do more or less compulsively, the best answer is probably, because. Just because. I don't know why. Why do people get tattoos or wear their pants around their knees? Because. But seeing as I try to make a living of sorts promoting the building of skin boats, I feel the need to come up with an answer that sounds more insightful than because. I feel the need for giving some pragmatic reason for wanting to build skin boats. 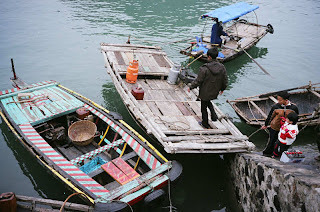 Actually, I doubt that there is any kind of sensible reason for skin boats but the one that sometimes suggests itself is that it might be useful some day to know how to build skin boats. You know like after our civilization collapses. Yeah maybe. 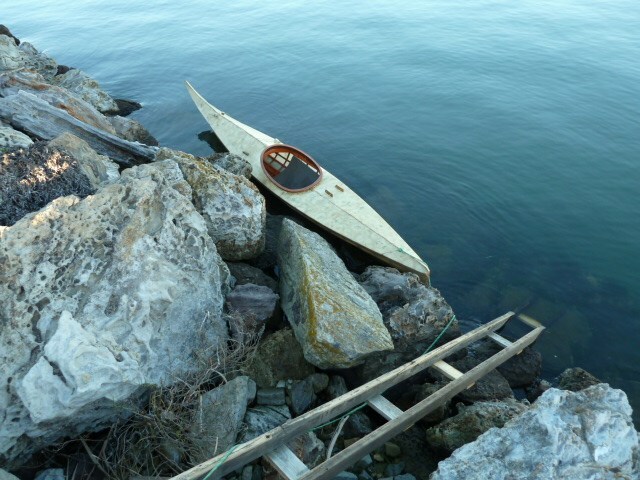 The post-apocalyptic boat builder. Trailing a hand cart he roams abandoned subdivisions and with a crow bar and hammer strips plywood and two by fours out of old buildings. Back at his waterfront lair in what used to be a surf and turf supper club he and his cohorts work on a boat lashing the members together with electrical wire and cover the whole thing with a skin made of awnings sewn together. Yeah, maybe. I have at one time put together a whole kayak with materials I did not buy. Everything was either scrounged, beach combed, harvested (willow ribs) or salvaged (a skin made of scraps left over from other boats). Whenever I build a boat, I like to use some materials that are just laying around. 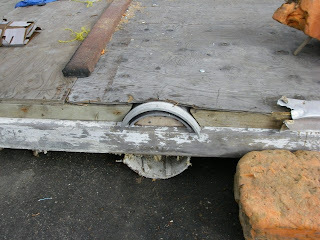 For the most part, it's a piece here and there from the scrap pile, but large parts like gunwales invariably are easier to buy than scrounge. 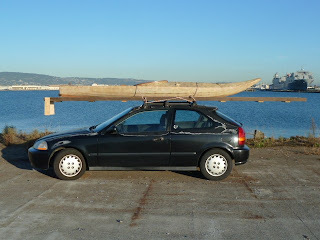 So yes, some scrounging and re-use goes into my own boats, but the building of an entire boat from scraps is more like a stunt than a practical means of going about the process. But there are places in this world even today where people don't just go to a lumber yard to get their boat materials. They scrounge or harvest local materials. For them, this isn't a stunt. It is necessity. They may be too poor, or they may have had an apocalypse for real, like the Vietnamese who had their economy destroyed by a long war. They build boats with what they have. Skinboat building lends itself to the spirit of survivalist post-apocalyptic boat building even if it really isn't. But people built skin boats not because it was a cool thing to do. It was in a way, the only sensible way to build boats given what they had for materials. Anyway, further musings on this topic may arise, in the meantime some photos and links. 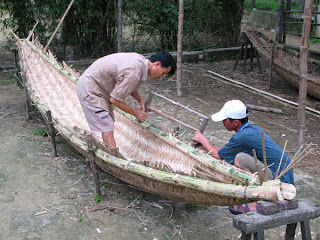 The following photos are from the boats and rice website dedicated to indigenous boat building industry of south east Asia. 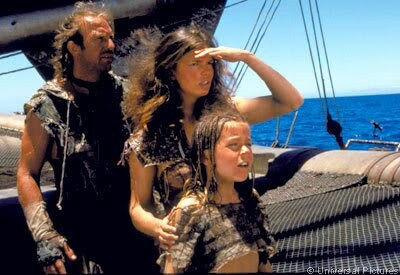 Actually, a lot of what I think of as post-apocalyptic boat building is really just third world boat building. That's probably because the third world is essentially a world before a whole lot of technology and money, a lot like what a world after a whole lot of technology and money would look like as well. If you like this sort of boat, check out the Indigenous Boats Blog of Bob Holtzman. One of my favorites. This definitely qualifies as post-apocalyptic boat building. Nothing store bought almost. The whole thing scrounged, except for some nylon monofilament line used to do the lashing, but that could have been done with local materials if need be. Decked over basket boats. I like the one on the left, quartered automobile tires serve as fenders. looks like wooden barricade parts making up the seats, but maybe that's just artistic flair on the part of the builder. Also check out the oar locks on the boat in the rear, rags tied around vertical stanchions.